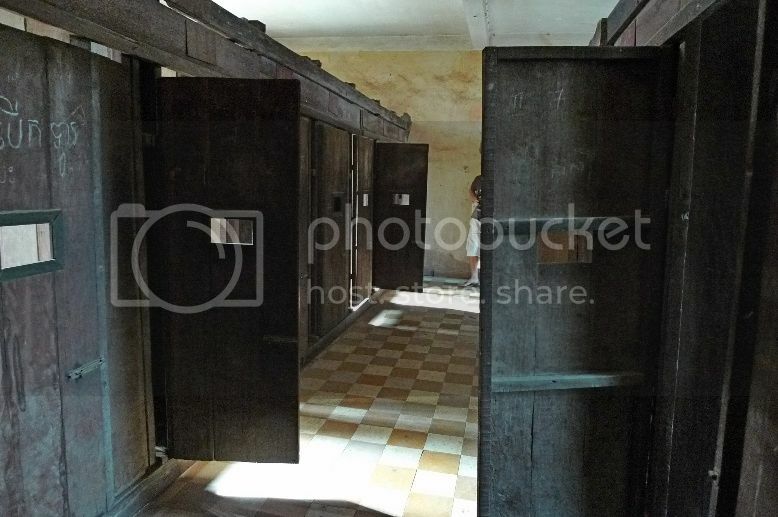 The Tuel Sleng Genocide Museum, previously a security prison known as S-21, has 4 main buildings, known as Building A, B, C and D.
Building A holds the large cells in which the bodies of the last victims were discovered. Building B contains galleries of photographs. 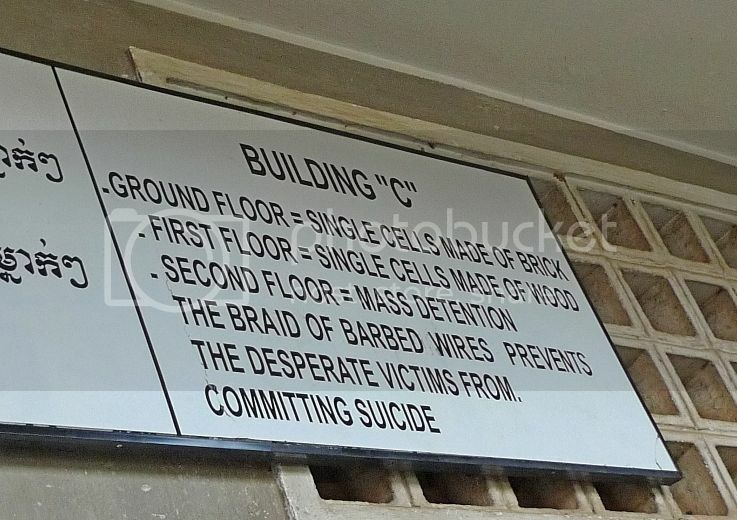 Building C holds the rooms which were sub-divided into small cells for prisoners. Building D holds other memorabilia including instruments of torture. After seeing the paintings by Van Nath, we went over to Building C. The ground floor of the building consists of single cells made of bricks. I tried to take picture of a single cell unit but stopped short of stepping inside it. 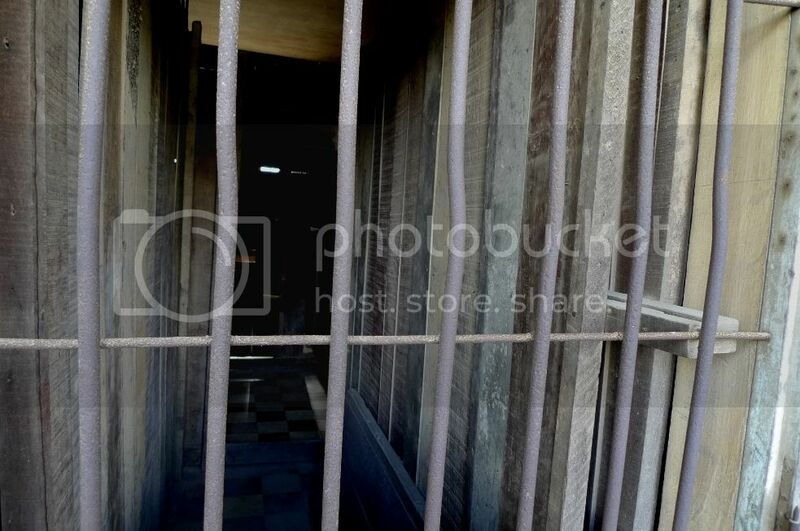 In some cells one can see iron chains and shackles but as I did not dare step into any of the unit, I did not take any photos of them. 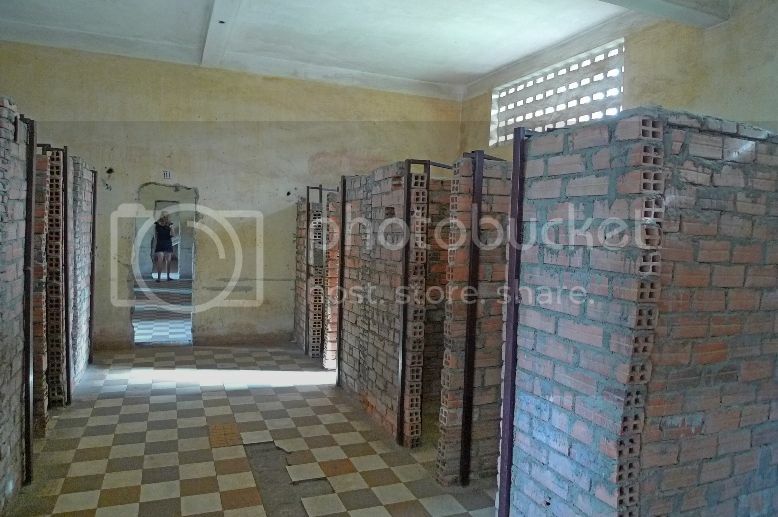 As the S-21 security prison was formerly a high school, so what you see was actually a classroom that was divided into many tiny brick cells where prisoners were kept. The chief of the prison was Khang Khek Leu (also known as Comrade Duch), who was a good friend of Pol Pot, leader of Khmer Rouge. Can you believe that Duch who was responsible for all the torture and killings in S-21, was a former mathematics teacher? If he had not been a good friend of Pol Pot, he would have probably been tortured and killed like all the others since the Khmer Rouge targeted educated people! We then went up to the first floor of the building. The first floor contains single cells made of wood. 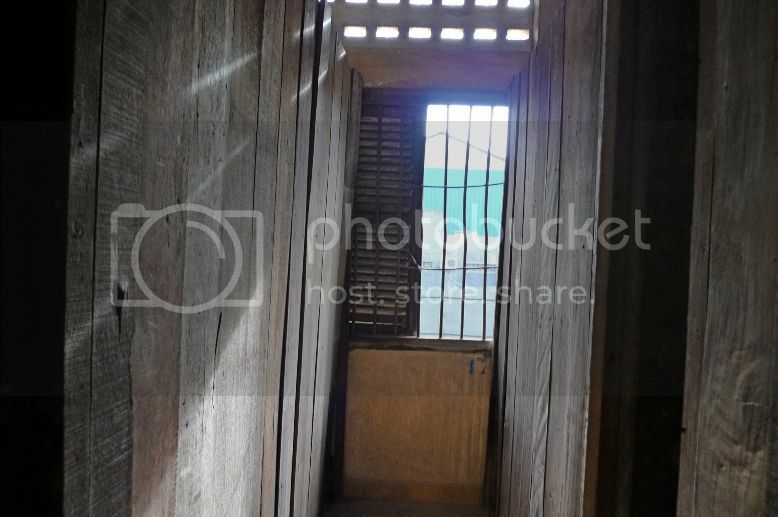 As I walked past each wooden cell, I could imagine the horrors that happened here about more than 30 years ago. There were stories that prisoners were treated badly. They were given only four small spoonfuls of porridge and watery soup twice a day. Drinking water without getting the guards' approval would result in serious beatings. 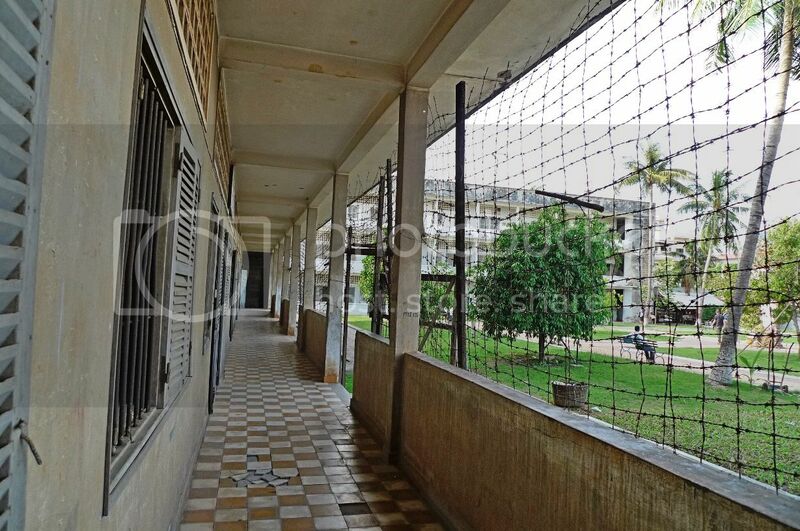 I could not help feeling a little eerie walking past these cells that afternoon. 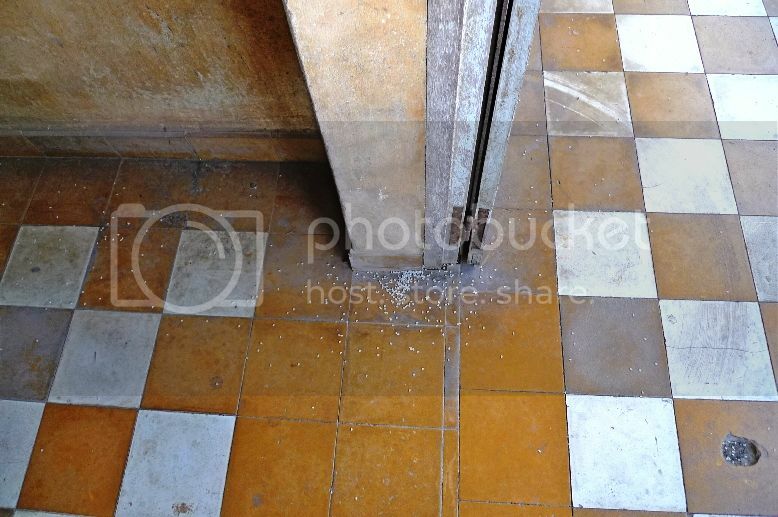 Inside some of the cells and at corridors, I could see rice sprinkled on the floor. These rice were offerings to the spirits. 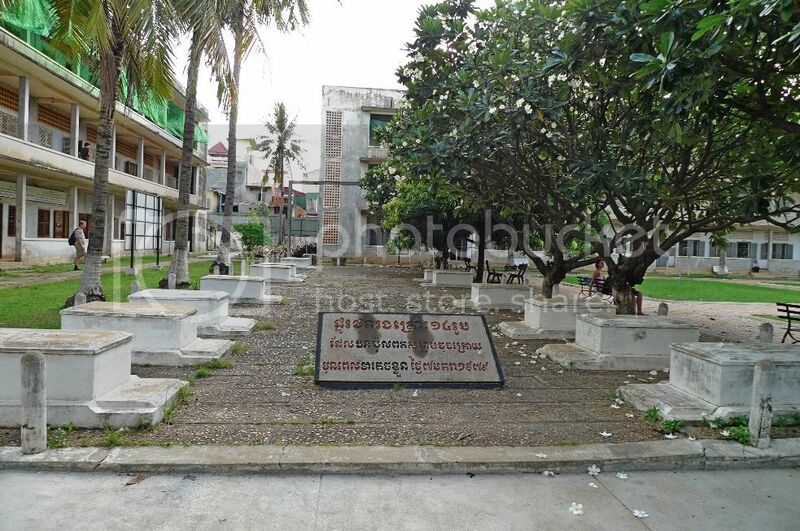 Many Cambodians believe the ghosts of the victims continue to haunt the place. I do not doubt it. We went up to the second floor. 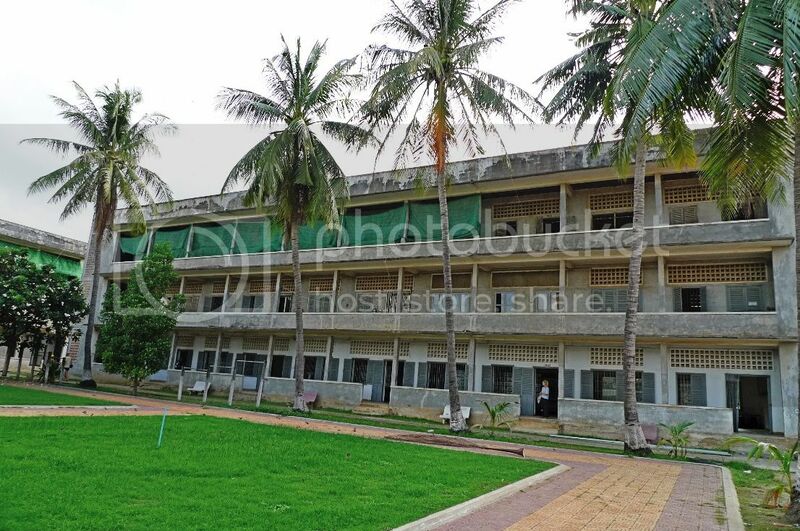 It was used for mass detention. 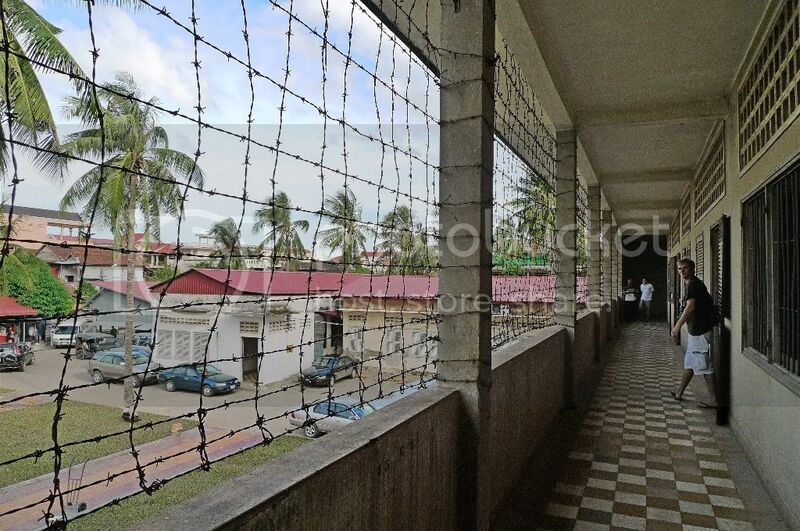 Barbed wires were placed there to prevent desperate prisoners from committing suicide. 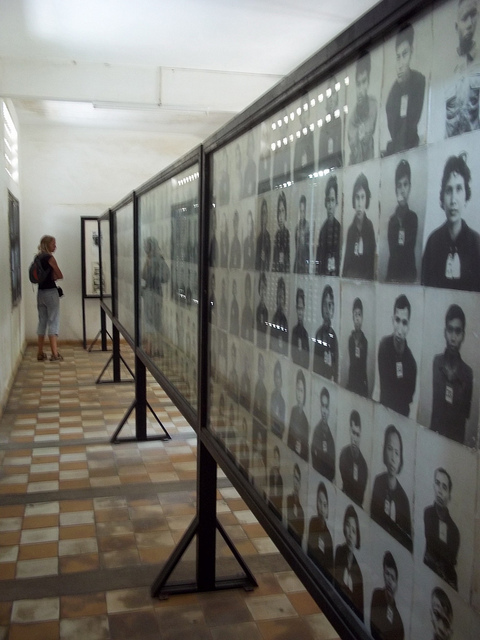 Inside each room were thousands of photos of the victims. Some photos had notes that you can read. I felt emotional reading the stories. I refused to take any pictures of the victims as I felt uncomfortable having such pictures in my camera. Below is a picture taken from the Internet. I had to step out of the room to take a breather. I was feeling very down, almost depressed. It was as if the whole place wanted to drag you down with it. We then went to Building D where we saw the instruments of torture used by the guards. I did not even want to take photos of them! Looking at the tools and imagining how they were used to torture the victims were too much for me to stomach! 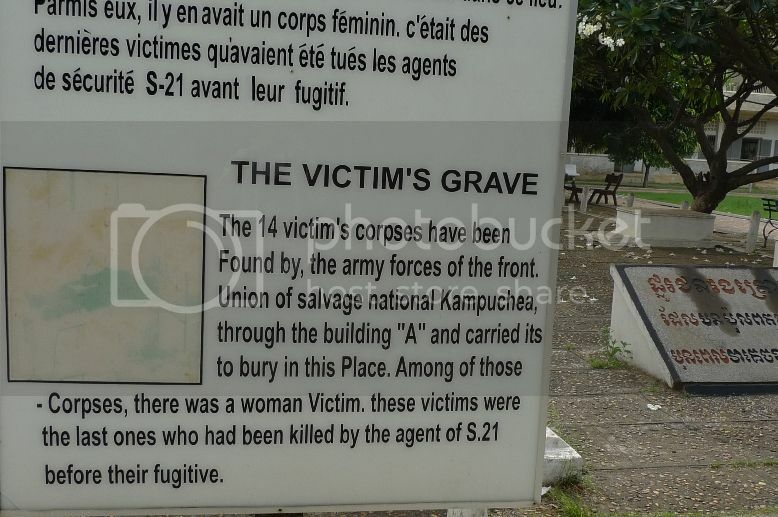 Outside Building D, there was a grave dedicated to 14 victims found in Building A. They were probably the last ones killed by the agents of S-21. 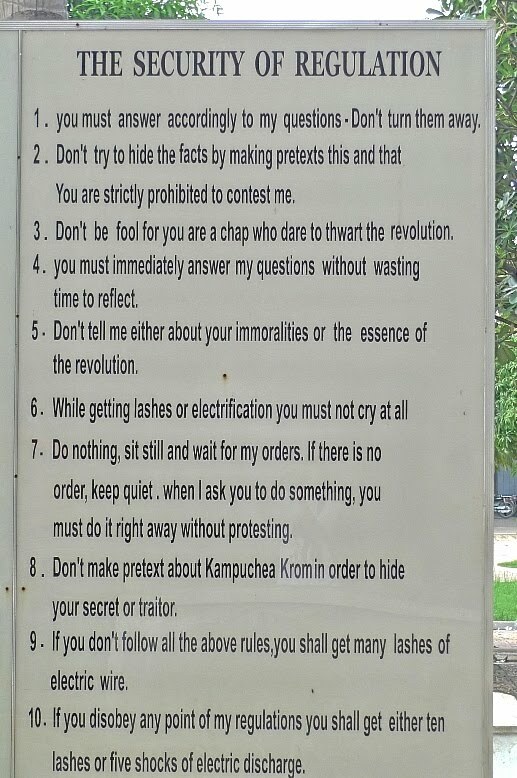 Having seen with my own eyes the horror of this genocide, I was wondering if the leaders of Khmer Rouge would ever be punished and if Cambodians would somehow be healed from this dreadful history of their nation. There are Cambodians who had lost whole families, and I doubt they would ever find closure to this horrible event. 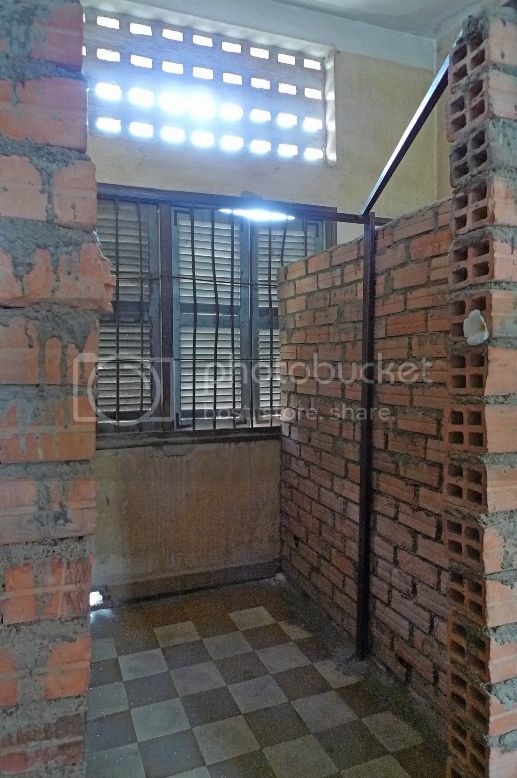 Meantime, the trial of the Khmer Rouge leaders is still ongoing. Pol Pot, the leader, had died under house arrest in 1998 at the age of 72. 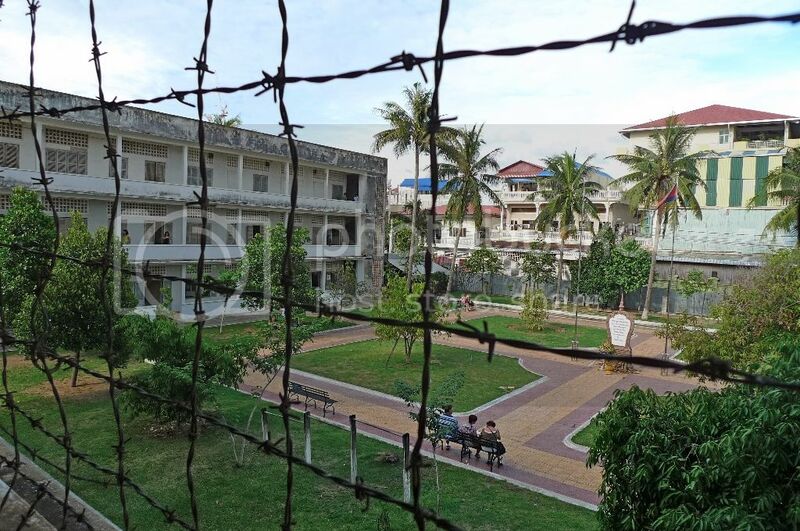 The remaining ones being tried are former Deputy Secretary of Khmer Rouge Nuon Chea, 84, former Head of State and Chairman of the party’s Central Committee Khieu Samphan, 79, former foreign minister Ieng Sary, 85, and his wife Ieng Thirith, 79. All four have pleaded non guilty. Upon my return from Cambodia last July, I read a piece of news that stuck out like a sore thumb. Duch, the S-21 prison chief, had just been convicted and sentenced to 35 years in prison, but was reduced to 19 years for time served. That was absurd! How can a man responsible for thousands of deaths be sentenced to only 35 years? He should be getting life imprisonment! 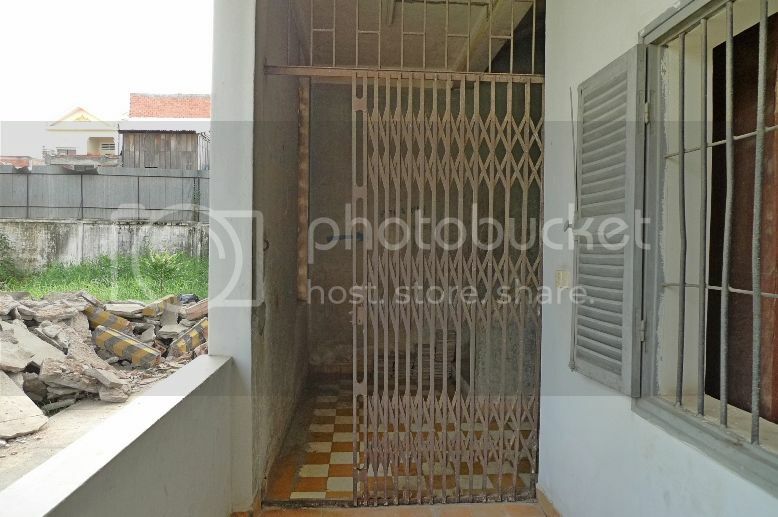 NOTE : Coincidently, after I put up this post, the news came out the next day that the trial of the remaining 4 Khmer Rouge leaders had resumed. The four had tried to shift the blame to the late Pol Pot. I sincerely hope that justice for the Cambodian people will be found and that they will finally have closure. Follow latest development HERE. 5 Reasons To Stay Away From Instant Noodles!